It’s mind boggling to think of all the wonderful candles made right here in the USA. But what about overseas? I don’t like being held back by boundaries ”“ do you? That’s why the beautiful candles of Caroline Hey Hutchinson were so intriguing to me. Ms. Hutchinson is owner of CHH Design and she makes breathtakingly beautiful candles, among other things. Ms. Hutchinson’s locale? The UK. One visit to CHH Design and you’ll find that Ms. Hutchinson is a true artiste. The candles are just an extension of her already well-established line of hand-painted bone china pieces. You can find glassware, bowls, cachepots and so much more. And candles. Oh yes, the candles. What a joy it was to have the opportunity to review such fine works of art! I received the Diversity style candle scented in Paris and a Limited Edition Scent-Sationals Cubist design candle. What did my CHH Design candles look like? bottom part of the gift box was a bright pink ”“ so cute! Opening the lid of each box revealed the candle nestled inside with a fabric lining. Quite luxurious from the start. Each candle was so incredibly unique and delicate. They are shaped as mini-flower pots and the bone china felt so light and airy in my hand. The Cubist design was quite fun ”“ it had gold paint that divided it up into varying sizes of squares and rectangles. Each “panel” was then painted uniquely ”“ a paisley design, some leaves, some flowers. 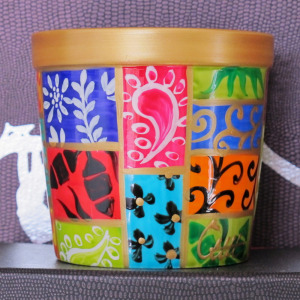 The panels were different background colors, too, which made for a lovely candle vessel. The Pink Paisley Diversity candle had a bright pink paint around the vessel. White paisley designs were painted all over. Both candles had a gold trimmed rim. The wax color was a dark purplish-black and there was a single wick in both candles. What did my CHH Design candles smell like? Bingo! My sniffer has become pretty good at picking out certain scents after all these years! I’m not a patchouli fan, but once I read the description I headed back to this candle to see if I could pick out this particular element. I did begin to notice it, just at the end of each whiff. It added to the complexity of the scent without being that overwhelming, musty patchouli scent that I detest. I did light this candle in my standard testing room, which is a relatively small powder room with high ceilings. I left the candle and returned in about 30 minutes and noticed a very gentle scent in the air. As I kept returning to the room, I kept picking out notes of amber and sandalwood… those scents remain in the forefront. But this was a very complex scent and the aroma wafted in the room throughout the burn. It was a mild scent throw, but one I could definitely detect and enjoy. I thought it was perfect for the powder room! Although the website doesn’t mention what scent is housed in this beautiful candle, it did smell very similar to the scent Paris. I did find this candle available online on the UK Amazon.com website and it did indicate that Paris was the scent within this candle. I had a similar experience with this candle as I did with the Pink Paisley Diversity Candle. How did my candles burn? These were very slow burning candles that were quite enjoyable. Because of the slow burn, it did take a couple of hours to get a full wax melt pool. But I was able to get a full pool on both candles and there was no wasted wax to be found! The slow burn also meant I was able to enjoy each of these candles for a long, long time. Each candle is slated to burn for 60-80 hours and I would find that to be accurate. I had no problems with the wicks whatsoever. These were very low maintenance candles that were an absolute joy to burn! Caroline Hey Hutchinson has designed a thing of pure beauty ”“ gorgeous handpainted porcelain vessels that house an aromatic candle inside. These candles give off a relaxing, soft aroma that is very calming and is in perfect alignment with the sophistication of these items. What I found most enjoyable was the way that the container glowed while burning each candle – it was mesmerizing! These one-of-a-kind candles are like a gift that keeps on giving. Once the candle was done, it was very easy to wipe out the container and showcase it in my living room. Now that I have a couple of these containers, I want more candles to add to the collection. As we gear up for the holiday season, I could see these making perfect presents for your loved ones. The great news for those of us in the US is that these candles are now available on Amazon.com! Luxury right at your fingertips…give CHH Designs a try!